I have a big family - sixteen aunts and uncles and many, many cousins. Thanks to our grandparents we all seem to share a passion for debate. One of the more heated and reoccurring discussions is on the topic of climate change. This is not surprising given I have generations of family members working in the Alberta oil sands as engineers, marketing executives, and environmental assessments experts. I also have family members who lead environmental organizations and who have been on the front lines of pipeline protests and the divestment movement. My family is not unique. In boardrooms and around kitchen tables across Canada we are grappling with competing narratives. Like most debates, we are generating the kinds of insights needed to drive change, but we are also entrenching the positions that keep systems stuck in old patterns. Enter the Energy Futures Lab (EFL) and the Energy Futures Fellows. These 40 diverse experts are committed to the difficult conversations that are necessary to create breakthrough business models, and ‘future-fit’ policies and practices. As bellwethers and cultural influencers they are willing to share these big conversations with their networks – families, colleagues and communities. The Fellows do not yet agree on the specific innovations needed or the policies that will lead to the energy system of Alberta’s sustainable future, but they do agree that it is vitally important to engage Albertans in the conversation. This is what sets EFL apart from other system changing labs. Traditional labs have been built around a Chatham House Rule approach. Difficult, complex conversations are facilitated among a tight group where individuals experience transformational leadership opportunities, and build mutual trust. This leads to new collaborative approaches and initiatives. However, many past lab participants have found reintegrating into their organizations and businesses more difficult than expected. Their colleagues, families, and communities have not taken the same journey or experienced the same shifts in perspective. They have not been exposed to the same new ideas. What looked promising from inside the lab runs into real world resistance. The EFL is taking a different approach by opening the space to broader conversations. Culture – is made up of the dominant paradigms (narratives) and shared mental frames (values) that underlie an entire system. It is culture that shapes goals and definitions of success. Regimes – are the political, economic and social institutions, regulatory frameworks, infrastructures and technologies, (rules of the game) as they exist. Together these pieces make up complex societal and economic systems that tend to be resistant to change. Niches – are protected spaces in which innovators are able to experiment with new technologies and approaches that challenge the dynamics of the current system. They often fail to infiltrate the system because of stabilizing feedback loops between culture and regimes. Culture plays an essential role in allowing models that exist at the niche level to scale and take hold in regimes. Shifts at the cultural level can support new innovations from the niche level, enabling and facilitating change in regimes. Most system change processes focus almost exclusively on technological innovation and large-scale policy shifts to integrate and scale innovations. The EFL recognizes that engaged citizens co-create a receptive culture, and that this is essential to the long-term success of new innovations. This is democracy at its best and a model for the world. 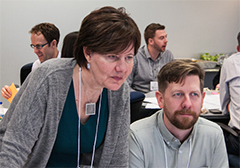 The EFL design has two strategies to engage Albertans and is adding more as Fellows identify new ways to connect with communities across the province. First, in the Fellows' second workshop in January, they prioritized a long list of topics to facilitate “big conversations” with the media and other public channels. They also identified other influencers with distinct viewpoints to engage in dialogue over the next six months. Such conversations will continue to roll out over the course of the Lab, and our hope is that it will spark conversation amongst Albertans at home and at work. Secondly, and more directly, is the Energy Futures simulation game, The Newtonian Shift. The game allows individual Albertans with or without direct experience in the energy system to play key decision-making roles in a simulated energy system. The more than 30 roles in the game include oil, gas and renewable energy executives, mayors of cities and rural communities, coal and steel company marketing executives, and key leaders of First Nations and NGOs. In our polarized cultural space the game invites individuals to experience the system from multiple vantage points. It is surprising how real life situations are mirrored in the game, and how an entrenched perspective can dramatically shift when complexity and pressure are applied. Many players state that it is the closest they have come to putting themselves in someone else's shoes. In the extensive debriefing session following the game the dominant theme is that each player has new insights and empathy for the role they played. And they express an appreciation for how difficult, convoluted and necessary it is to be working together to achieve a thriving, prosperous and sustainable future. We call this the “radical middle”. With new experiences and perspectives we can co-create a space where we build trust and begin to strategize on a desired future where our children and grandchildren can thrive. Diversity of opinions makes us stronger as families, Lab participants and frankly, as a nation. Our unique life experiences and narratives are not what define our separateness but are critical contributions to a more realistic, whole view of a system. With the support of the Alberta Real Estate Foundation we’ll be taking The Newtonian Shift across Alberta by invitation of municipalities, businesses, and other organizations.